Q1. If ‘DELHI’ is coded as ‘73541’ and ‘CALCUTTA’ is coded as ‘82589662’ then how ‘CALICUT’ will be written in that code language? यदि ‘DELHI’ को ‘73541’ के रूप में लिखा जाता है और ‘CALCUTTA’ को ‘82589662’ के रूप में लिखा जाता है तो उसी कूट में ‘CALICUT’ कैसे लिखा जाएगा? Directions (2): In each of the questions given below are given some statements followed by some conclusions. Read all conclusions and give the answer as follows. नीचे दिए गए प्रश्न में कुछ कथन दिए गए हैं जिसके कुछ निष्कर्ष दिए गए हैं. सभी निष्कर्ष पढ़ें और उत्तर दें. All tables are trains./सभी टेबल ट्रेन है. 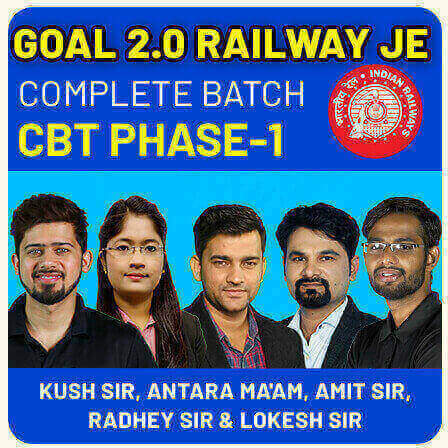 All trains are buses./सभी ट्रेन बस है. Conclusions : I. 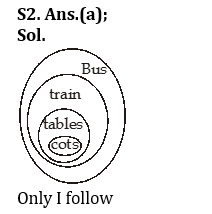 All tables are buses./ निष्कर्ष: I. सभी टेबल बस है. II. All trains are tables./ II. सभी ट्रेन टेबल है. (a) If only conclusion I follows. / यदि केवल निष्कर्ष I अनुसरण करता है. (b) If only conclusion II follows. / यदि केवल निष्कर्ष II अनुसरण करता है. (c) If either conclusion I or II follows. / यदि या तो निष्कर्ष I या II अनुसरण है. 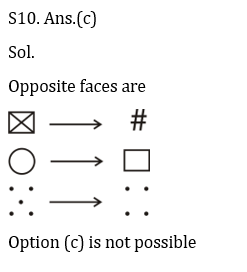 Directions (3):- In the following question, choose the option figure in which the question figure is embedded. निम्न प्रश्न में, उस विकल्प को चुनें जिसमें प्रश्न आकृति एम्बेडेड है. 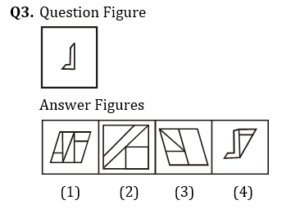 Directions (4) : In the following question first question figures are given, showing a sequence in which paper is folded and cut from a particular section below these figure a set of answer figures showing the paper actually acquires when it is unfolded are also given. Select your best answer. निम्नलिखित प्रश्न में पहले प्रश्न आंकड़े दिए गए हैं, जिसमें एक अनुक्रम दिखाया गया है जिसमें पेपर को एक निश्चित अनुभाग से मोड़ा और कटा गया है इन आंकड़ों के नीचे उत्तर आंकड़ों का एक सेट यह दर्शाता है कि इसे खोले जाने पर यह किस प्रकार का दिखेगा. अपना सर्वश्रेष्ठ उत्तर चुनें. Q5. 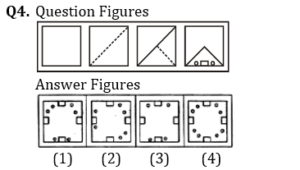 In the following figures, square represents Dentists, triangle represents Collectors, circle represents Indians and rectangle women. Which set of letters represents Indians who are either collectors or women? 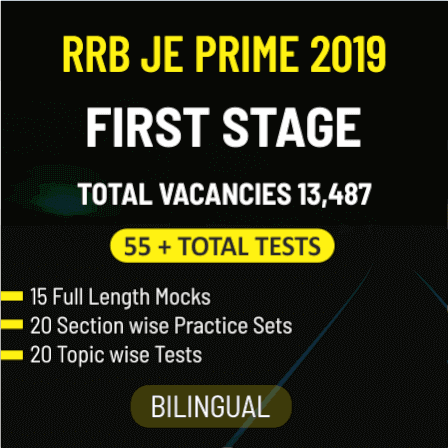 निम्नलिखित आंकड़ों में, वर्ग दंत चिकित्सकों का प्रतिनिधित्व करता है, त्रिभुज कलेक्टरों का प्रतिनिधित्व करता है, सर्कल भारतीयों और आयताकार महिलाओं का प्रतिनिधित्व करता है. पत्रों का कौन सा सेट भारतीयों का प्रतिनिधित्व करता है जो या तो कलेक्टर या महिला हैं? Q7. From the given words, select the word which cannot be formed using the letters of the given word. CHEAT, as there is no ‘E’ in LATCHING. Q8. In a certain code language, ‘+’ represents ‘x’, ‘-‘ represents ‘+’, ‘x’ represents ‘÷’ and ‘÷’ represents ‘-‘. What is the answer to the following question? एक निश्चित कूट भाषा में, ‘+’ , ‘x’ को दर्शाता है, ‘-‘, ‘+’ को दर्शाता है, ‘x’, ‘÷’ को दर्शाता है और ‘÷’, ‘-‘ को दर्शाता है। निम्नलिखित प्रश्न का उत्तर क्या है? 56 ÷ 8 + 12 – 72 = ? ⇒ 56 ÷ 8 + 12 – 72 = ? Q10. Which of the following cube in the answer figure cannot be made based on the unfolded cube in the question figure?